Instagram has rolled out a new feature which allows users to share GIFs from Giphy in Instagram Direct conversations. 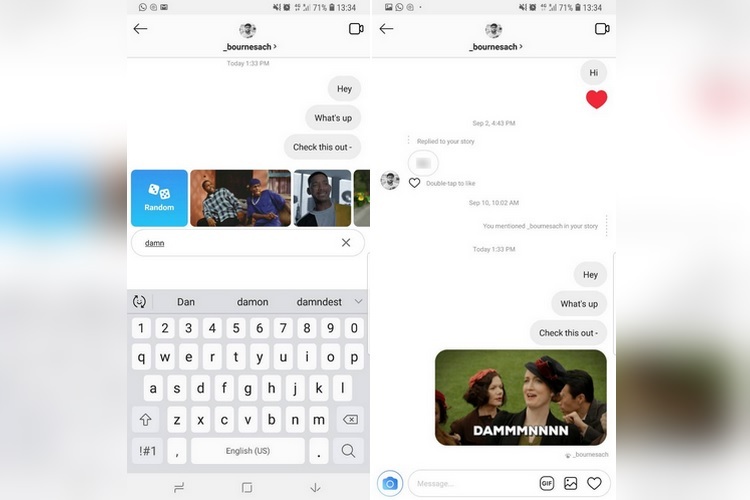 Giphy is one of the largest and most popular databases of GIFs on the internet and its integration in Instagram Direct is a neat addition that will certainly make conversations more interesting. The feature has begun rolling out on Instagram for iOS and Android. Following the update, the text bar now shows a ‘GIF’ button, which can be tapped to open a carousel of GIFs from Giphy’s database. You can then search by keyword or phrase to insert the gif in the conversation. There’s also a ‘random’ button which sends any GIF relevant to the keyword. Instagram has also introduced another minor tool called ‘See all by creator’, which shows users all GIFs created by that Giphy user. To check all GIFs from a creator, just long press on a GIF and tap on the ‘See all by creator’ option which appears in the pop-up menu. You can also choose to like a particular GIF by tapping on the heart icon that appears below it. In other news about Instagram, The Verge reported that Instagram is testing a new resharing feature. The feature, was reported as ‘seamless sharing’, and was supposed to introduce a ‘share to feed’ option for resharing posts from others. However, an Instagram spokesperson has denied the report and has told Mashable that the company is not testing or developing a resharing feature of any kind.